Amazing Colonial in Rochester! Relax on the patio enjoying the large lot that this 4-5 bedroom, 4.1 bathroom beauty has to offer! 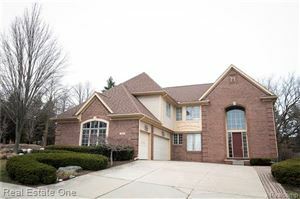 4 BR on the upper level including a separate guest suite with full bathroom. BR 2 & 3 have J&J bath with separate vanities. Master BR has gas FP, 3 closets & MasterBath with jetted tub, separate shower, dual vanities. Gorgeous Newly renovated Kitchen with high end appliances, granite, beautifully tiled backsplash, cooktop w/hood, double oven & Butler's Pantry. Spacious nook w/large patio door & opens to FR w/additional large windows, views of the amazing landscaped yard & cozy fireplace. Many features add charm including Large study, Dining Room and Living Room, 1st Floor laundry, neutral paint. Finished basement w/high ceilings and additional 1150 sf of living including 5th BR, full bathroom, craft nook & large rec room. Ideally located w/quick access to expressways, shopping & dining. Rochester Schools. Swim and Tennis community! Move in Today!